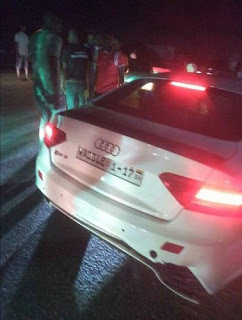 Reports Dawuroo.com is picking up has it that, The Arab Money Gang (AMG) leader, Criss Waddle was involved in a car accident yesterday, 26th February 2018 which happened to be his birthday night. 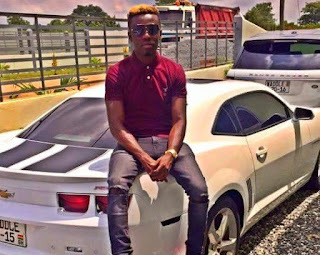 An overexcited Criss Wadle who has been trumpeting his birthday all over social media for days now was apparently going out to a private party with his friends when the unfortunate incident happened. According to an eyewitness, the convoy the AMG boss was traveling with equally suffered some damage during the crash. 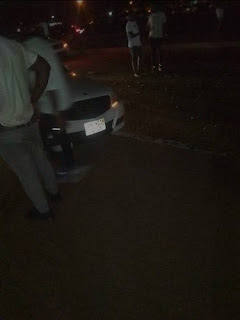 It is yet to be revealed what really caused the accident but reports Dawuroo.com has gathered so far reveals that Criss Waddle escaped safe and sound. We are following the issue and will report more soon. 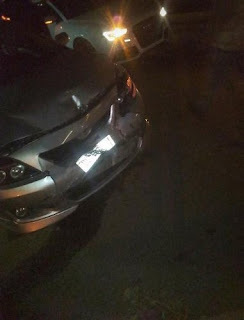 In the meantime, below are photos of the Criss Waddle accident.